Have you ever wondered how to write in one of earliest Ancient Greek calligraphic scripts? Wonder no more! I’m happy to present the first video I’ve made for Found in Antiquity, so that you can see first hand how to write the alphabet in Greek Uncial. What exactly is Greek Uncial? Greek Uncial hails from the first few centuries of the Common Era. Unlike Ancient Greek cursive, Uncial is surprisingly readable even if you’re mostly used to reading modern Greek letter forms. While most of the surviving examples were written on parchment, Greek Uncial started life on papyrus and was generally used for literary texts like Homer’s Iliad (below). 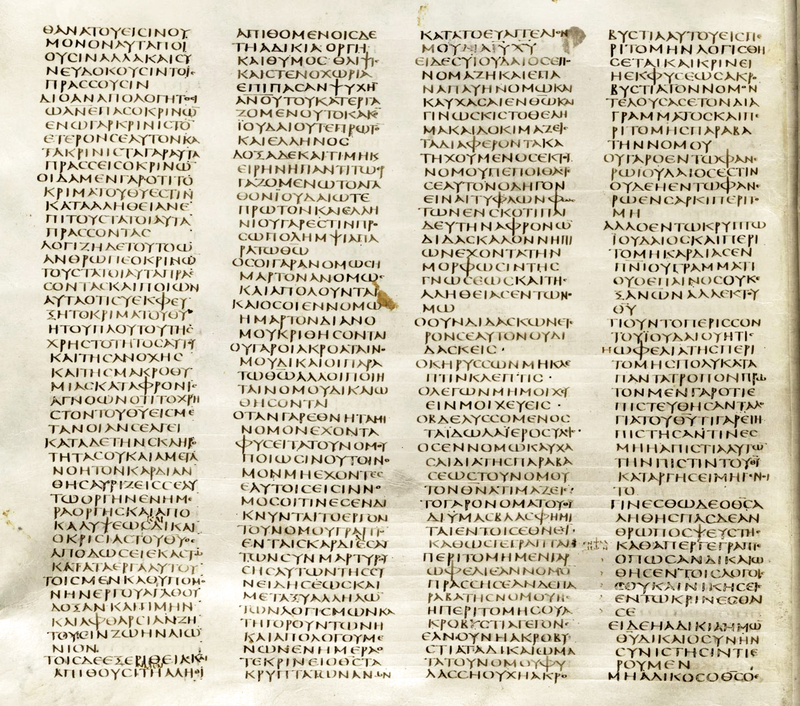 2nd century AD, Greek Uncial on papyrus. From Thomson, An introduction to Greek and Latin palaeography (1912), p142. It is an understated script. There are very few serifs or extra decorations. Its minimal aesthetic makes this script look very clean and crisp. The paleography textbooks I’ve consulted tend to praise the Greek Uncials of the first few centuries for being elegant and not exaggerated in line width variation. The story goes that Uncial gets its name from the Latin word for “inch”, uncia, because the characters were supposed to be an inch high and an inch wide. There was also a contemporary Latin script which is called Uncial. The two script styles are related but different, as several Latin Uncial letters are rounder than those in Greek Uncial (e.g. the Latin d is rounder than the Greek delta). It is very easy to find how-to guides for calligraphy in the Latin Uncial script, but strangely very difficult to find any instructions about how to write in Greek Uncials. A lot of Greek things are sadly underrepresented on the internet and I hope this guide will help make this beautiful script more accessible to my fellow Classics enthusiasts. I based my imitation of the Greek Uncial script on the most famous manuscript written in Greek Uncial: the Sinaitic Codex. This massive parchment codex is the earliest entire volume of the New Testament to have survived intact. It was produced some time in the mid fourth century AD, while Christianity was flourishing in the empire following Constantine’s edict of toleration. This manuscript is also much earlier than most of the non-fragmentary manuscripts of our familiar Classical texts, except perhaps the comedies of Terence. The Siniatic Codex was written with a reed pen – feather quills did not appear until about the 6th century AD. 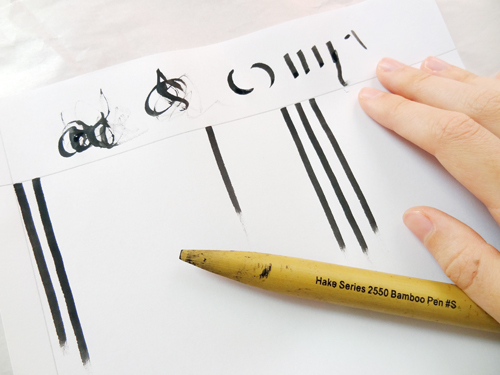 The most convenient way for me to simulate the reed pen was to buy a bamboo pen, and happily this is also the cheapest calligraphy pen in existence (at less than $4.00 in my local arts supply store). Today these pens are still used by Arabic calligraphers. They work surprisingly well, especially considering that these things are essentially sticks. They are sold un-trimmed like the pen in the picture above, so you’ll need to use a very sharp knife to trim the point to get a flat edge of whatever thickness you desire. I worked out from experimentation that you shouldn’t angle your cut to give a wedge on the bottom of the point, because the ink overflows if you do. 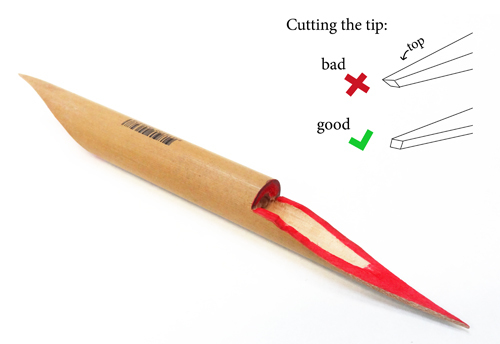 Try to cut your pen point to a clean 90 degrees or angle the cut so that it slopes on the top and not on the bottom. That should give you a nice sharp edge to write with. 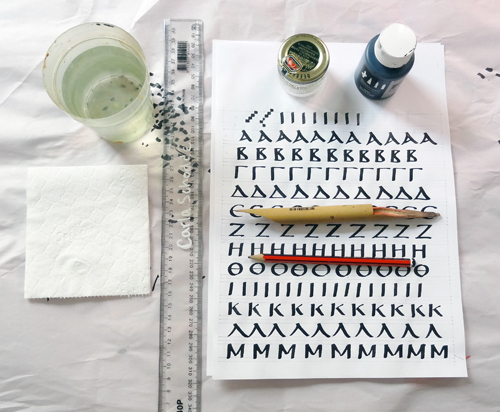 Calligraphy can be messy, so it’s best to line your table with paper. You’ll need ink for your pen, and an inkwell or something to put the ink in so that you can dip as you write. You don’t have to use an old marmalade container as I have – anything which doesn’t spill or leak will be fine. It’s also nice to have water nearby, in case you feel like diluting your ink, and it’s quicker to clean up your pen afterwards if the water is right there. There’s also a rag or piece of tissue to wipe your pen on when you clean it. 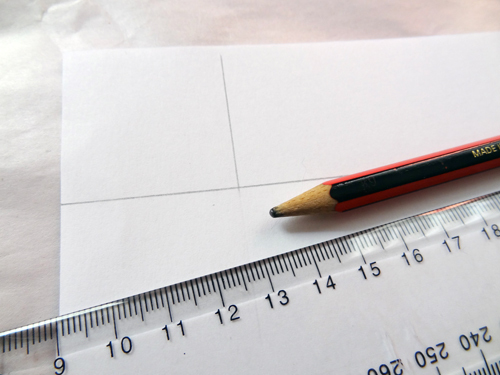 The pencil and ruler are for drawing up guidelines. If you’ve done calligraphy before, this should sound familiar. But if you haven’t tried using a flat edged pen before, start experimenting with what it can do. You’ll find that you can’t actually write with it the way you could with a pencil or a ballpoint pen. 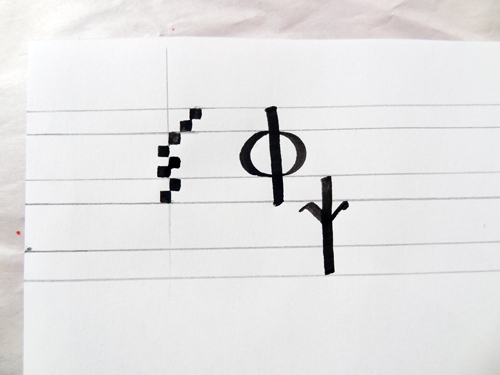 Calligraphic letters are not written, but constructed using several strokes. Try making strokes from top to bottom and left to right, with your pen angle close to horizontal for uncial letters. You’ll also find that the pen runs out of ink and you have to keep dipping. It doesn’t take too long to get used to the idea of dipping your pen whenever it runs out of ink. As an exercise, try making the longest line you can in one stroke. This shows you how much ink the pen can hold, which is not a huge amount. Now we’re going to draw up guidelines on paper so that we can practice giving each of the letters the right proportions. 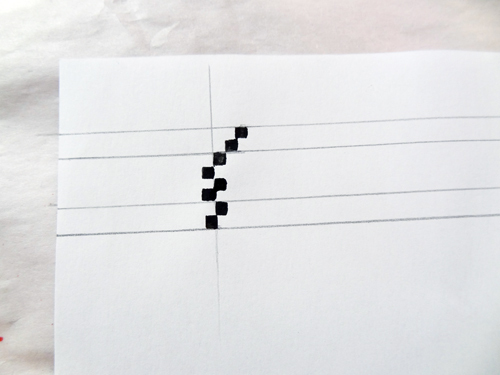 Start by ruling a horizontal line all the way across the page near the top, and then add a vertical line near the left. Next, we’ll measure up how high to rule the x-height, the ascenders and the descenders. The x-height is the height of the main part of the letters (like the round part of the Latin letter b), the ascenders are the strokes which rise above the x-height (eg. the tall stroke in the Latin b) and the descenders extend below the base line (eg. the low stroke in the Latin p). Ascenders and descenders are rare in Greek Uncial; only rho, upsilon, phi and psi have descenders, while only the latter two have ascenders as well. We should aim for an x-height of 4 nib widths with ascenders and descenders of 2 nib widths. Make a checkerboard pattern of four squares stacked vertically, then add two more squares above and below. Then rule out horizontal lines to match these measurements. At this point I could have ruled up the rest of the page according to this three-sectioned pattern, but I noticed that the space between the lines of writing in the Sinaitic Codex is quite cramped, so to replicate this I made my ascender and descender space overlap. Essentially this meant I had alternating spaces of 4 nib widths and 2 nib widths. Phi and Psi share their ascender and descender space. Because sharing is caring. Practicing Greek Uncials is really quite fun. I particularly enjoy copying out portions of manuscripts, as it means I can engage with ancient texts more intimately than I’ve done before. I might not be the best calligrapher in the world, but at least now I can empathise with the work of ancient scribes. That experience, for me, is its own reward. So don’t wait any longer. 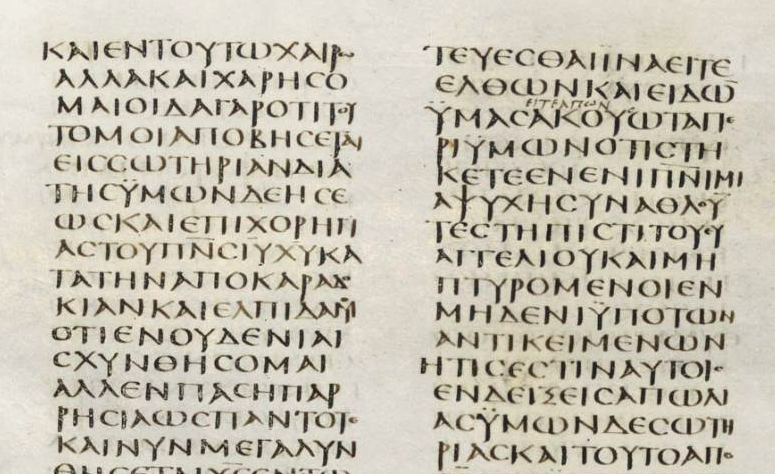 Head over to the Codex Sinaiticus Project’s website and find some attractive examples of letters to copy from. You can learn the Greek Uncial alphabet in whatever order you feel comfortable with, though I think it is easiest to start with iota, omicron and lambda to get used to the basic shapes of the letters before copying out entire passages. If you’re unsure as to what the stroke order of the letters should be, you can check out my video again. I based my stroke order on what I could deduce by looking closely at the letters of the Siniatic Codex and observing the stroke order in some examples of modern Greek calligraphy. Greek Uncial is a beautiful script, elegantly simple and very readable too. In particular, the fourth century style is probably the most celebrated of the Ancient Greek book hands, and it really shouldn’t be so difficult to find out how to actually write it out. I hope that my guide will help make this worthy script more accessible to my fellow Classics enthusiasts. Michelle P. Brown, The British Library Guide to Writing and Scripts: History and Techniques (Toronto: University of Toronto Press, 1998), 57. Posted in Art and Artefacts and tagged ancient calligraphy, Ancient Greek, calligraphy, codex sinaiticus, Greek Uncial, Latin Uncial, manuscript, Sinaitic Codex, Uncial. Bookmark the permalink. Looks like much patience is needed for this! Where are you dear Carla? I hope the debate over at my blog has not made you sad. Dialectis at the MoR’s is a bit rough at times. I was in the past badly hit at my blog and at other laces but then I learned. You have valour, my friend. Besides I realise I have not replied to you. Which made me inversly sad, thing being I am overwhelmed by the stupidity of thinking I must write a post a day – which actually stresses me quile a lot lol. I hope we’ll interect again. I’m not sad at all! 🙂 I’ve been quite busy at work, so I haven’t been able to reply much. It’s good to hear that you recently found a good pastor who spoke from the heart and from sound theology. Also, thank you for reblogging my Greek Uncial! I just wanted to gently say that you spelled my last name “Shodde” and “Shodder” when it should be “Schodde”… it’s a minor thing, but thanks for reposting anyway. Thank you! I just discovered your blog. All the books on medieval/ancient calligraphy are focused on Latin, and this is the first I’ve found for Greek. Marvellous, especially the hint about the bamboo pen. If you ever post on typographical conventions, I have an edition of the Iliad published in 1659 with facing Latin translation. The Greek typography uses all sorts of abbreviations, ligatures, and odd letter forms. I’d love to find out how all the symbols work.